If you’re like me, you had never heard of Elizabeth von Arnim until the recent episode of PBS’ smash hit Downton Abbey, when a valet gave a copy of Von Arnim’s Elizabeth and Her German Garden to his love interest. Von Arnim, however, was a hugely popular author during the Edwardian era depicted on the show, and her first novel Elizabeth and Her German Garden, published in 1898, was a spectacular success that underwent repeated printings (twenty-one, in fact, in its first year in print alone). Von Arnim published a further twenty novels in the early 20th century, most of them successful, before slowly slipping beneath the literary radar over the last fifty years. Von Arnim’s star, however, is once again on the rise as interest in the author re-surges in the wake of Downton Abbey. So who was this mysterious author? Elizabeth von Arnim was born Mary Annette Beauchamp in Australia in 1866, but was raised in England, the daughter of a prominent merchant. While undergoing a tour of Italy in 1891, she met a Prussian aristocrat, Count von Arnim, who she soon married. The couple moved into the Von Arnim estate in Pomerania, where they had five children despite the gradual deterioration of their marriage. Count von Arnim, referred to as the “Man of Wrath,” in Elizabeth’s semi-autobiographical novels, went deeply into debt and was soon sent to prison for fraud. In an effort to raise funds, Countess von Armin adopted the pen-name “Elizabeth” and went to work on a brooding but satirical novel about her experiences in Pomerania. The result, Elizabeth and Her German Garden, was published by Macmillan in 1898 and became a huge success for its wry observations on aristocratic provincial life. The “Man of Wrath” died in 1910. For the next few years Elizabeth was the mistress of H. G. Wells, before she married her second husband, John Russell, elder brother of Bertrand. Their marriage, however, was also a failure. Elizabeth soon fled briefly to the United States where she permanently separated from her second husband, although they never divorced. In 1920 she began a long-term affair with the British publisher Arthur Stuart Frere-Reeves, thirty years her junior. Frere would later name his daughter Elizabeth in her honor (a move which undoubtedly thrilled his wife). Elizabeth spent the next thirty years writing frequently and entertaining guests at her homes in London, France, and Switzerland before the outbreak of World War II forced her to relocate to the United States. She settled in Charleston, South Carolina where she died in 1941. Von Arnim’s literary output was much-lauded in her lifetime. Her themes were frequently feminist and her style admired for its dry wit. In addition to Elizabeth and Her German Garden, other standouts were “Vera” in 1921, often considered her masterpiece, The Enchanted April in 1922, and Mr. Skeffington in 1940. Currently, her books are not particularly collectable and first editions are cheap and easy to come-by. Will the recent resurgence of interest in Von Arnim be maintained? If so, perhaps it’s time to build a Von Arnim collection. If you're like me, you had never heard of Elizabeth von Arnim until the recent episode of PBS' smash hit Downton Abbey, when a valet gave a copy of Von Arnim's Elizabeth and Her German Garden to his love interest. Von Arnim, however, was a hugely popular author during the Edwardian era depicted on the show, and her first novel Elizabeth and Her German Garden, published in 1898, was a spectacular success that underwent repeated printings (twenty-one, in fact, in its first year in print alone). Von Arnim published a further twenty novels in the early 20th century, most of them successful, before slowly slipping beneath the literary radar over the last fifty years. Von Arnim's star, however, is once again on the rise as interest in the author re-surges in the wake of Downton Abbey. So who was this mysterious author? 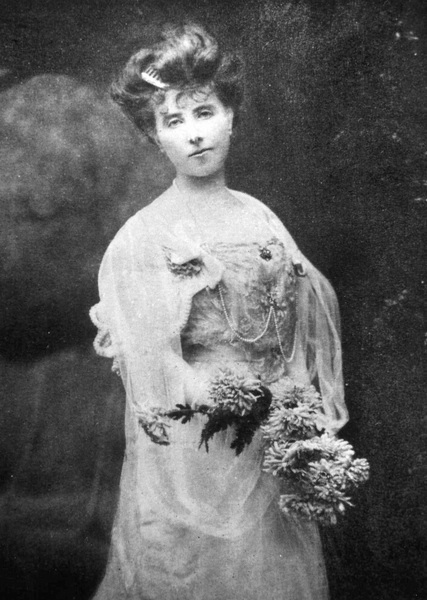 Elizabeth von Arnim was born Mary Annette Beauchamp in Australia in 1866, but was raised in England, the daughter of a prominent merchant. While undergoing a tour of Italy in 1891, she met a Prussian aristocrat, Count von Arnim, who she soon married. The couple moved into the Von Arnim estate in Pomerania, where they had five children despite the gradual deterioration of their marriage. Count von Arnim, referred to as the "Man of Wrath," in Elizabeth's semi-autobiographical novels, went deeply into debt and was soon sent to prison for fraud. In an effort to raise funds, Countess von Armin adopted the pen-name "Elizabeth" and went to work on a brooding but satirical novel about her experiences in Pomerania. The result, Elizabeth and Her German Garden, was published by Macmillan in 1898 and became a huge success for its wry observations on aristocratic provincial life. The "Man of Wrath" died in 1910. For the next few years Elizabeth was the mistress of H. G. Wells, before she married her second husband, John Russell, elder brother of Bertrand. Their marriage, however, was also a failure. Elizabeth soon fled briefly to the United States where she permanently separated from her second husband, although they never divorced. In 1920 she began a long-term affair with the British publisher Arthur Stuart Frere-Reeves, thirty years her junior. Frere would later name his daughter Elizabeth in her honor (a move which undoubtedly thrilled his wife). Elizabeth spent the next thirty years writing frequently and entertaining guests at her homes in London, France, and Switzerland before the outbreak of World War II forced her to relocate to the United States. She settled in Charleston, South Carolina where she died in 1941. Von Arnim's literary output was much-lauded in her lifetime. Her themes were frequently feminist and her style admired for its dry wit. In addition to Elizabeth and Her German Garden, other standouts were "Vera" in 1921, often considered her masterpiece, The Enchanted April in 1922, and Mr. Skeffington in 1940. Currently, her books are not particularly collectable and first editions are cheap and easy to come-by. Will the recent resurgence of interest in Von Arnim be maintained? If so, perhaps it's time to build a Von Arnim collection.